Brighten up your vacation in this colorful, coastal unit. Holiday Surf and Racquet Club #307 accommodates up to 6 people, with a king size bed in the master bedroom, a queen bed in the guest bedroom and a queen sofa sleeper in the living room. The interior is coastal comfy and has tile floors throughout and a newly updated kitchen with granite counter tops. Sit back relax and marvel at the spectacular Beach and Ocean views from your private balcony - you are truly on Vacation!! Don't forget all the wonderful amenities Holiday Surf also has to offer - a great outdoor heated pool, Fitness room, Sauna, plus Tennis courts and Shuffleboard with Free equipment rentals. Oh...and did we mention - we are directly located on our very own Private, White Sand Gulf Beach. What more could you want?! We definitely coming back to this place. Its a wonderful place, condo, and most of all, right in front of the beach. Plus not far away from the boardwalk for more scenery and fun. I most definitely recommend with my friends and family. Room was clean and besides were only using it for sleep and relax. So no comment on the condo. 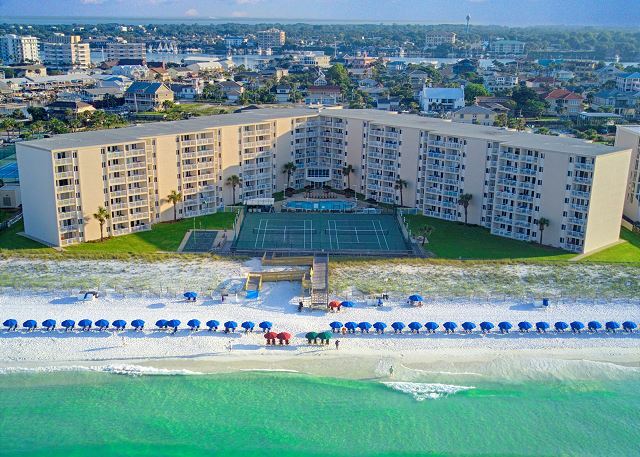 We have stayed at Holiday Surf and Racquet several times, but have not been to Destin in years so we thought we would take our kids back this year. We love the location, as well as the easy access to the beach, and now even easier with a handicap ramp. This was great because my Dad as well as Mother-in-law have trouble getting around. The staff are great, as are the chair guys on the beach. Our room was really dated, and just didn't seem that clean. We are not to picky so we just roll with it and go on. Very relaxing even with all the construction going on! The condo was very nice. My only disappoint was that I could not get down too the beach. Missed the steps down too the beach. Wished they had been fixed after the hurricane. The new entry was very nice. we go to holiday surf and racquet club every summer. the guys that worked at the beach were very nice and helpful. They are the main reason we go husband has COPD and they were very helpful to us as they would save us a chair so he would not have far to walk. Room 307 was great! We would definitely stay here again! Thanks Holiday Surf and Racquet Club for another wonderful vacation!! My Easter stay with my children was a bucket list item completed. The condo was beautiful . Loved the colors. We had everything we needed except enough towels . I feel there should be a laundry service on each floor or more towels in each condo.